Buy Christmas Designs, Christmas Presents and Gifts, Santa - quality that Russian Treasure store is known for. Christmas, the most favorite holiday, celebrated around the globe. The most awaited festive day by the children all over the world. What makes this day so special? It is Christmas decorations, designs and presents that attribute Christmas to the most beautiful celebrations of the year. Gift giving, an essential part of this magic holiday, makes the hustle and bustle of Christmas gift shopping the usual year-to-year experience. Russian Treasure welcomes you to our store where one can enjoy and buy a great selection of Christmas decorations, presents, Christmas gifts, hand carved wooden Santas and many more exclusive holiday designs. The quality gifts found here at Russian Treasure will make your Christmas the most unforgettable and pleasant holiday that you will share with your family, friends and loved ones. Russian Treasure proudly features Russian lacquer boxes, Matryoshka nesting dolls, hand carved wooden Santas and other Christmas designs that feature exclusive winter and Christmas themes and will make the best presents to your most special persons. Christmas shopping and buying at Russian Treasure will be your best experience ever. Don’t miss your chance – Christmas is always just around the corner. 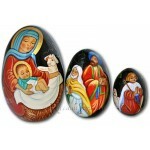 Number of dolls: 3 Artist: Ivanova School: Simbirsk Size: 3.5’’ These Russian Stacking Eggs feature a story of Jesus’ Birth. This set of Russian Stacking Eggs was personally selected f..